We all know that person who regularly cancels plans or calls in sick to work because they’ve "got the flu”. Sure, the flu season is upon us (and it's an especially nasty one), but a case of influenza is a lot more serious than the sniffles and a sore throat. 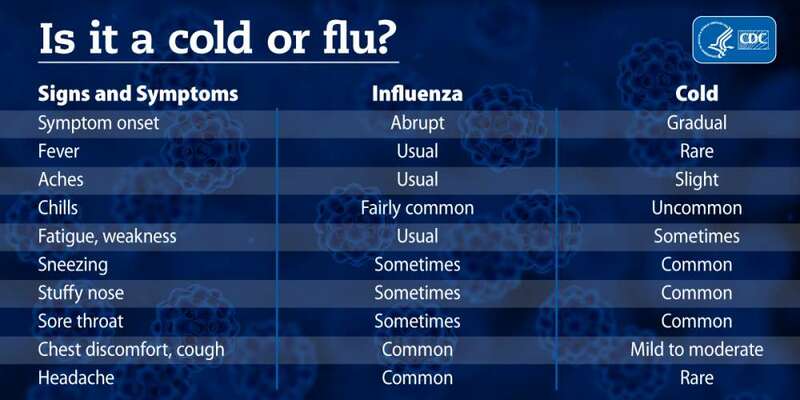 Twitter has sparked some informative and funny conversation about how to tell whether you’ve got the flu or whether you need a hot tea and a lie-down. The long and short of it: If you are not in bed feeling like you must have sinned in a past life, it’s not the flu. On a more serious note, the US Centers for Disease Control and Prevention (CDC) has also published a neat, easy-to-follow table to distinguish the two illnesses, which you can check out below. Not only could it put your mind at ease, it could also help you work out whether you really need to see a doctor or you should just take it easy for a few days. As you’ve no doubt heard, this year’s flu season is a particularly nasty one. Influenza is incredibly diverse and different strains take root each year, making it pretty hard for scientists to predict which strain will have “good” year and which would be a problem. This year, it’s an especially aggressive strain knocking around called H3N2, which has killed at least 53 children so far. To avoid this horrible bug, regularly wash your hands with soap, wrap up warm, eat healthily, and consider getting the seasonal flu vaccine. More info about the jab can be found on the CDC website.